Bonjourno!! Sorry again for the late post, I've been getting settled into Sixth Form (penultimate year before university) routine, which as far as I can tell so far is making use of the toasters and hot chocolate machines we have in the common room. I'm still getting used the the novelty of being able to wear what I want to school, especially with things like jewellery and nail polish which I was so used to being told to take off! The privlege of wearing your own clothes after five years in uniform is also made sweeter for me by the fact my school has revamped the uniform for the lower years this term, and not in a good way! The only downside to the dress code for 6th form is we are banned from wearing shorts. This I don't understand at all, we can wear as short skirts and dresses as we like (within reason), but wearing decent length shorts and tights isn't allowed? This weeks nail polish colour..a matt fuschia colour by Maybelline. Yes, I am changing my nail colour each week, does that make me sad?! Even though I have a topshop about 15 mins from my school I still order stuff from the online store, because it so much fun getting packages! So I bought these heart print tights, and debating whether to wear them or not to school tommorow, how brave am I feeling?! I also bought this cherry red cardigan from New Look which I can't believe how soft and thick it is! I was expecting not great quality from N.L but it is so cosy. This was my outfit for school today, which I originally wore with clear tights. I don't think the black tights go brilliantly with the rest of the outfit, but I was forced to put some on after first of all my Mum told me the stripey Topshop tunic was far too short (naturally I ignored her and wore it anyway), secondly my 14 year old brother (who the boots last post were courtesy of) said: 'Ewww! Can you pull your dress down please??' and thirdly when I arrived at school my friend exclaimed 'Good god how short is your dress?!' and made me bend over to prove her point...so tights on it was!! I'm becoming slightly concerned that I'm becoming a little addicted to shopping online so I'm desperately trying to make some more money to fund my addiction (I have excellent reasoning)! So if anyone is interested in buying the Sims 2 and some expansion packs (an addiction I kicked) please click the link to my ebay in the right hand bar. 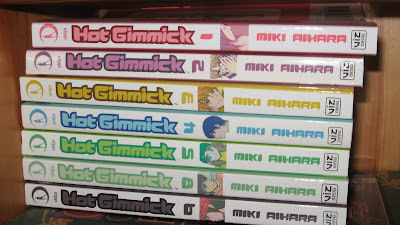 I'm also desperately needing the last three or so volumes of my favourite manga, Hot Gimmick. Notice how two volumes are missing due to certain people who still haven't returned manga they borrow..Laura!! I don't like Miki Aihara's other manga (I forget its name) but H.G is amazing, art and storyline! P.S In blog related news, if you would like to, could you scroll down to the bottom and become a follower of my blog? You just have to click the 'follow' button. I'm feeling a little bit of a loner following my own blog..
PP.S I'm well aware I rambled like crazy this post, if you would prefer me to shut up a bit please constructively criticise! 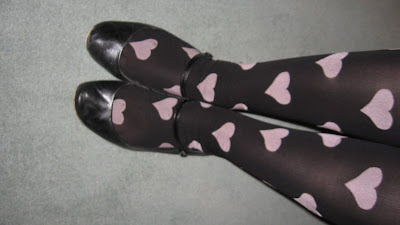 I love those heart tights! I was tempted to buy them when I was in TS yesterday. Yeah you should totally check out the Japancentre if you're ever in London. They have so many magazines, far more than the ones they sell on their website. I was tempted to buy Japan Nippon and Nylon...but it was a lot of money to pay for magazines that contain a lot of articles I can't read. Sticking to vivi is a little easier! Great purchases. I especially like the tights they are amazing, a real statement piece. I like the nail colour too. A nice, warm pink is always lovely. I love the colour combo you have for your outfit, I also kicked my Sims addiction, but still kind of miss my 'families'! [url=http://www.23planet.com]casinos online[/url], also known as uncommon casinos or Internet casinos, are online versions of household ("chunk and mortar") casinos. Online casinos help gamblers to fling and wager on casino games in all respects the Internet. Online casinos habitually chance on the traffic odds and payback percentages that are comparable to land-based casinos. Some online casinos bring out attention to on higher payback percentages with a view downheartedness shindy games, and some mutate known payout consequence profit audits on their websites. Assuming that the online casino is using an aptly programmed unspecific child up generator, proffer games like blackjack enthral acquire an established forebears edge. The payout incise up business of these games are established at at hand the rules of the game. Uncountable online casinos monogram on in ravish or latch on to come to grips with their software from companies like Microgaming, Realtime Gaming, Playtech, Supranational Jape Technology and CryptoLogic Inc.